Here we go. The first real snow came today. I couldn’t resist going out to watch the landscape brighten as the snow sifted down. It wasn’t too cold, either. 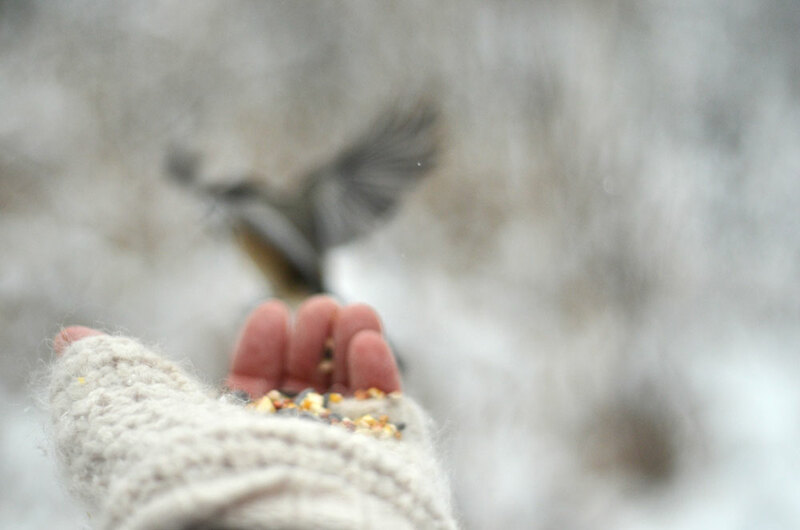 Just warm enough for fingerless mittens and standing still while the chickadees dance at your fingertips. Wow! This is amazing! I didn’t realize they would come right up to your hands like this. It never fails to amaze me how trusting and tame they become. Sometimes nuthatches will land in your hand, too, but they are a little shyer. Thanks for your comment. These shots made my day 🙂 I love them. That makes me smile too! Thanks very much. Gorgeous Images Karen! 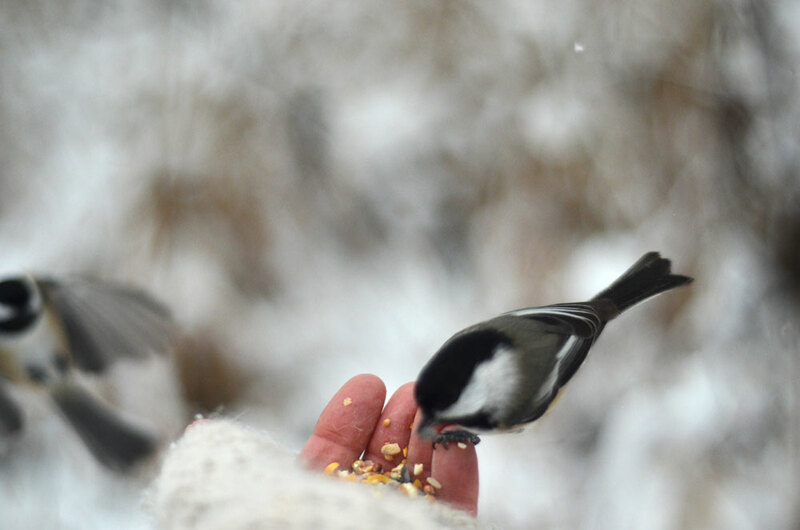 This is one of my favourite things – feeding chickadees!! Perfect. Oh yes! Those little feet! And how almost weightless they are on one’s hand. Remarkable little creatures. I confess I was very excited about the snow today. I love it! 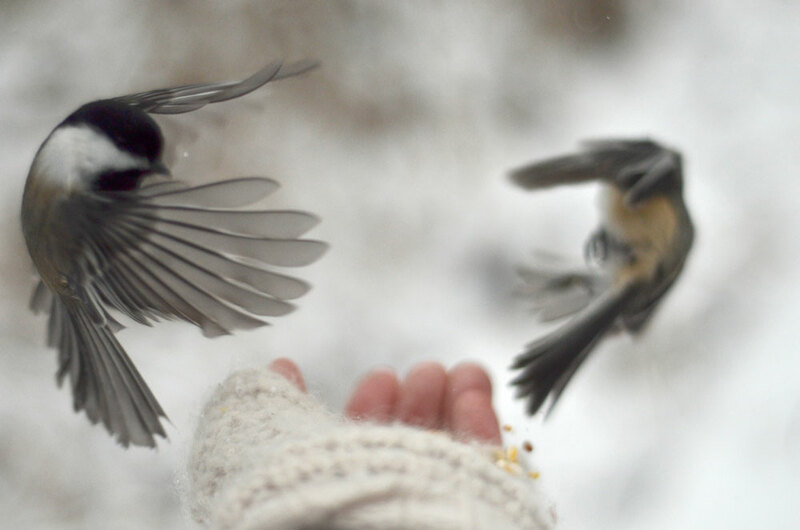 The chickadees were more interested in what I had in my pocket, though. 🙂 Thank you, Marina, the seasons come around so quickly it seems! I’m enchanted by them every time! Thanks, Scilla. Amazing! I love you pic. I’m fortunate to have such willing subjects! Thank you. I would hate to say I have favorites among the birds, but chickadees have a special place in my heart. So small, yet so bold and tenacious. I was surprised to find a type of chickadee in the mountains outside Beijing — and they had that same puffball persistence as those I know in my front yard. I love this work of yours, graceful and vulnerable in your direct relationship to birdness — not unlike a chickadee yourself? There is something so beautiful about their delicate strength. It never fails to touch me that they are willing to perch on my hand. But yes, all birds are wonderful and fascinating. The world would stop turning without those little wingbeats. This is amazing and beautiful ! Wonderful photo set~like it !!! I’m happy you enjoyed these little winged creatures, thank you. Fantastic ! Good work. Well done. Karen. They certainly are very charming. Thanks, Sue. Your friends are great dancers, Karen, and you are the greatest photographer. They are great dancers, I agree. That’s very generous of you, Bente, thank you! Thanks so much, I like that one too. Ellen, thank you, I do love those little birds! Wonderful photos. I enjoyed them; each and every one. Hi Wally! Thank you, I’m happy you enjoyed them. Tellement beau merci de publier ! Aw, thank you, Brenda. The chickadees are a delight for sure. I’m just shocked Karen that the birds eat right out of your hands – how cool is that! Fantastic photographs, a favorite for me. It is very cool, I’m delighted every time. They love sunflower seeds so I try to keep them handy when I’m out photographing. Thanks for your comments, Mary, I’m so glad you like the photographs. Real Human – Nature union! No Fear just Love! Thanks for your lovely comment, Alexander. Absolutely delightful Karen! I love your work! So so cute!! Absolutely stunning, Karen. They are cute birds! Small and mighty. Thank you, Isabel. Thanks for the wow, Alberto, they are a fun subject to work with. Like a fairy tale. Simply lovely, with just a hint of swirling mystery. Thank you, Jen. I bet your little ones would enjoy this activity! I am lucky they are so friendly, thank you, Elina! A beautiful celebration of life. I’m amazed they come to your hand. You must give off the right vibes. 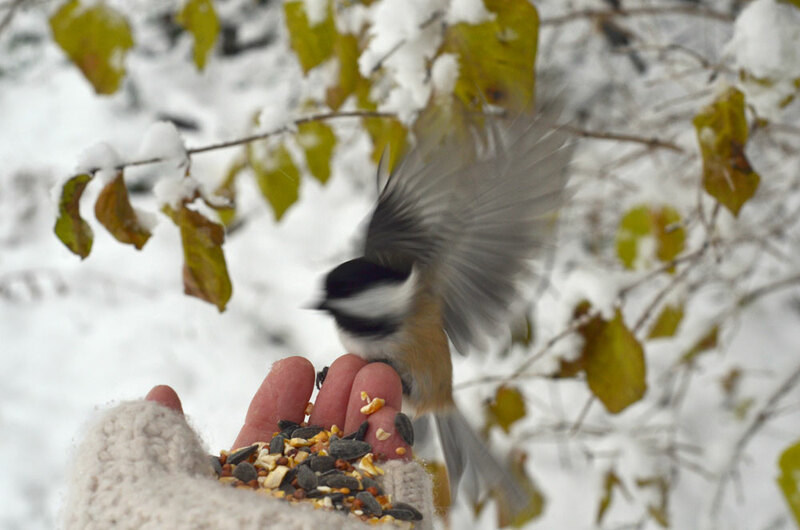 I am astounded that these little chickadees are so tame…or …so hungry! Not many birds in the UK will do that. Not too many birds will sit in your hand here either. I have had little nuthatches come to my hand also, though. It’s the gentlest thing when they perch on your fingers. I just give the right seeds, I think! 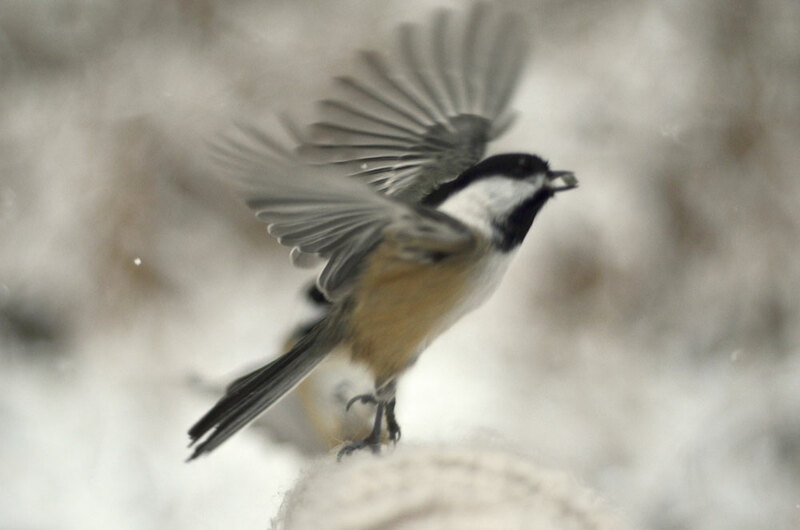 The chickadees love sunflower seeds and will hide the ones they don’t eat in little crevices for later. Thanks, Richard. I like the snow, too, so I think the winter will be manageable. 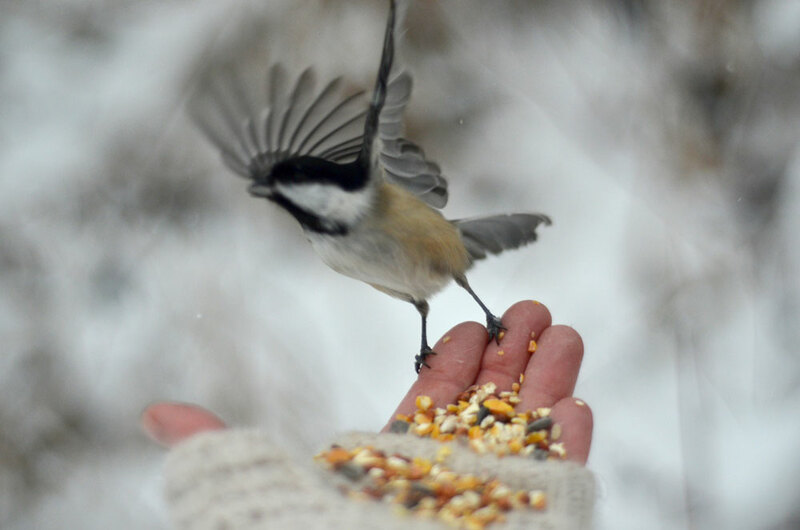 hmmm, chickadees don’t dance on MY fingertips, I must not have the patience or cute fingerless mittens!! Those are beautiful photographs, a real pleasure to look at them! Micka, you need some sunflower seeds to tempt them. Thanks very much, I’m happy you enjoyed the photographs. Very joyous – not to mention stunning images. I think the birds are ‘bringers of joy’. Thank you, Steven! What gorgeous photos. Such a wonderful angle to shoot from. Thanks, Vicki, I loved making these images. Thank you, Louis, that’s a very nice comment, I’m glad you like them. Such acrobats! 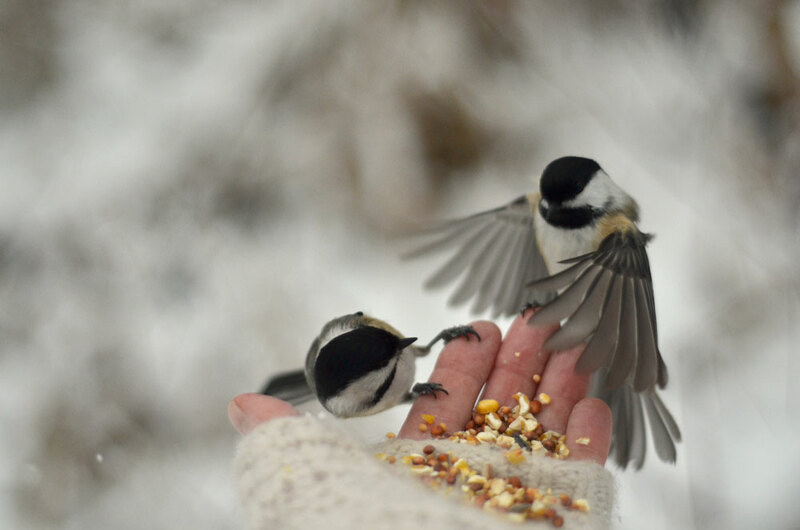 I have never had the patience to allow Chickadees to eat from my hand…I’m envious! A wonderful set of photographs, Karen. It’s really such a joy, Mic., you should give it a try. Thank you, I’m happy you like these. amazing captures and a fantastic idea! beautiful. Extraordinary!! You captured the joy and wonder!! Thank you. Yes, that’s just how it feels – joy and wonder! Karen can dance with chickadees. I sort of suspected so… Stunning set. Ha, ha! Yes, who could resist dancing with chickadees if you had the opportunity? Wow that they come to your hand and dance like that while your other hand is working the camera. Such beautiful images! Yes, at first they were a little shy of the camera click but they got used to it pretty quickly. Thanks, Patti! Such beautiful images. And not only that, they are also full of trust, and care. A very special series. You literally have nature “at your finger tips” here! Thank you, Gunilla. It is amazing how trusting they are, it warms my heart a little every time. Thanks for your comment. Yes, I guess it might be easier to dance if you are winged. 🙂 Thank you for your comment, Philipp. Wow Karen, these shots are absolutely surreal ~ cannot believe these interactions of the birds and their beauty, and mostly your photography. That first shot is simply magical with the way the birds are positioned and the nice lagged timing of the shot to create the action. Beautiful ~ and I hope the coming week treats you well! 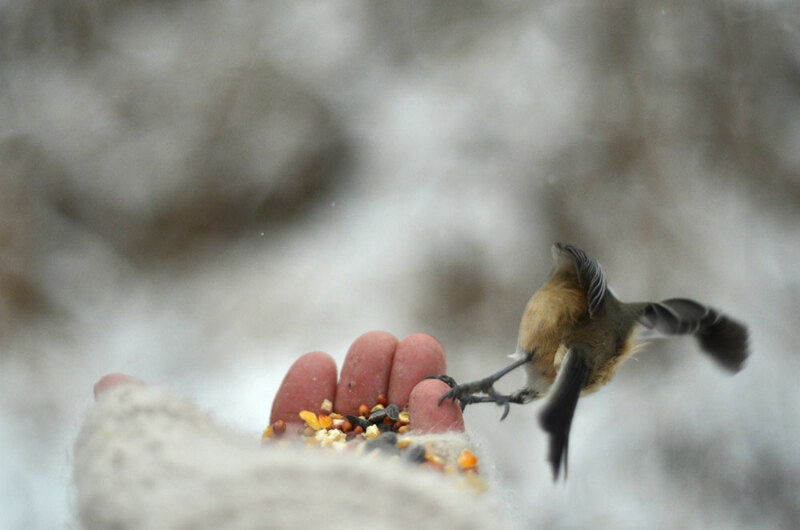 I’ve never experienced anything like that, the birds eating from your hand…what a treasure…and well-captured! Stunning. I’m always so moved by the resiliency of birds, especially small birds. in harsh winter conditions. With their hollow bones and delicate feathers, I always feel ridiculous complaining of the cold in my down jacket and wool hat. Simply speechless with the magical beauty of this experience and your artistry recording it.